I remember the first time I splashed out on a pair of 'posh' breeches, they were by Pikeur and cost over £100, they're still going strong and are beautiful to wear and ride in after many years of use. Proof they were worth every penny. ...the above is fabulous, but has made me somewhat blinkered to other brands, fearful of splashing the cash and being disappointed...so when I was sent a pair of Euro-Star breeches from Andrea Sexton PR I jumped for joy at the opportunity I had been offered. When my breeches arrived I loved everything about their vibrant appearance. They are raspberry, the must have colour for Spring/Summer 2016, the pockets decorated with sparkly diamanté jewels and the knees patterned with glittery grip patches. For me, it was love at first sight, however it wasn't until I placed my first leg (always my right...) into the Euro-Star Laura De Luxe Grip Tec breeches that I actually began to appreciate the Euro-Star brand. The founder (1959), Hans Gotzens was a pioneer in exploring new materials and product functionality with a passion and dedication to equestrian sport. Euro-Star continue to follow his vision to this day and have evolved into a leading equestrian brand, blending horse and rider into a perfect team. And this is something I totally get after wearing their product, I don't think I've ever ridden in anything so technical with such extreme comfort. I'll start from the waist down, they're hipsters but not the type that embarrass you when you bend down to bandage your horses legs...I have named them, dignified hipsters. Practical belt loops with the Euro-Star brand sewn in calligraphy letters stylishly placed above the back pockets, decorated in a shower of shining silver and black diamanté and studs that sparkle in the sunshine (these also feature on the front pockets). Whilst all this beauty happens on the outside, the fabric is an elasticated microfibre, multi-stretch material specifically designed for equestrian sport with the softest lining that my bottom loves. The fabric is lightweight, breathable and most importantly to me offers maximum mobility, I do not own another pair of breeches that are as flexible and soft against the skin as these. 10/10 for comfort. The knees are decorated with the innovative Grip Tec silicon print patches, and offer perfect grip whilst riding. I have seriously put these breeches through their paces wearing them dressage training, show jumping, hacking and cantering and it was during the latter I really noticed how secure they were, my knee wasn't going anywhere and I could feel the connection the Grip Tec gave me to the saddle. Not forgetting my ankles, the Laura De Luxe Grip Tec breeches have an innovative flex-cuff that closes the fabric around the leg without the need for velcro, for me this again highlights Euro-Stars dedication to comfort, reducing any bulk around the ankle, your legs slide effortlessly into your riding boots. The technical ability of the Euro-Star Laura De Luxe Grip Tec breeches has blown me away and now I want a pair in every colour, titanium being the top of my wishlist! So if like me, you play it safe and always sway towards your trustworthy brand, be adventurous and try something new...change is fabulous, embrace it, I have and I love it! Thank you to Euro-Star and Andrea Sexton PR for the opportunity. A panicked thought went through my mind...I don't have a number holder and I am entered into my first ever British Dressage competition at the weekend!! After a frantic Google, quickly discarding the idea of dressing Oscar in a white plastic disc I found Hamag and a speedy message to them confirmed a leather number holder could be in the post tomorrow. At the time my preference was a number to attach to my saddle pad, the competition was days away and I didn't want Oscar to take a dislike to anything attached to the headpiece of his bridle without a gradual introduction to it at home and Hamag had the perfect solution, the circular leather number holder for saddle blankets, designed to not fall off! All of their leather number holders are handmade in Australia with quality materials and a promise of lasting a lifetime, retailing at £25. The UK based customer service was impeccable, posting the item immediately which I received the next day. 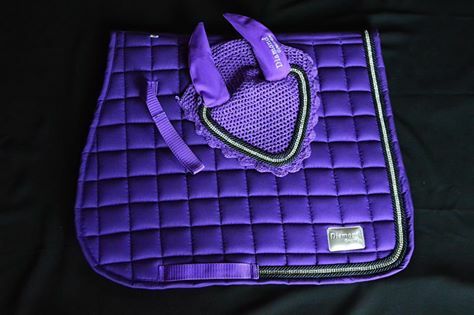 The leather is beautiful and my Hamag holds three numbers measuring 11cm x 8cm, the velcro is heavy duty and the reverse side can be stitched, pinned or glued to your saddle pad of choice. As a sewing enthusiast I chose to hand stitch mine, however my index finger didn't thank me for it, so be prepared for pin pricks! And, if I ever change competition pad I can easily sew on a new piece of velcro. 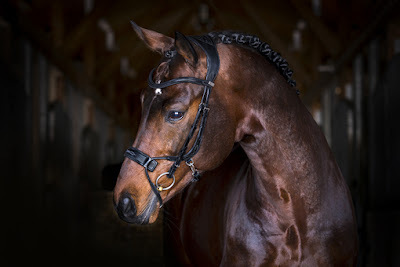 Now I am not in so much of a rush, I've taken time to admire Hamag's website and I love the patent and swarovski crystal bridle tags, one would look perfect with our PS of Sweden bling. 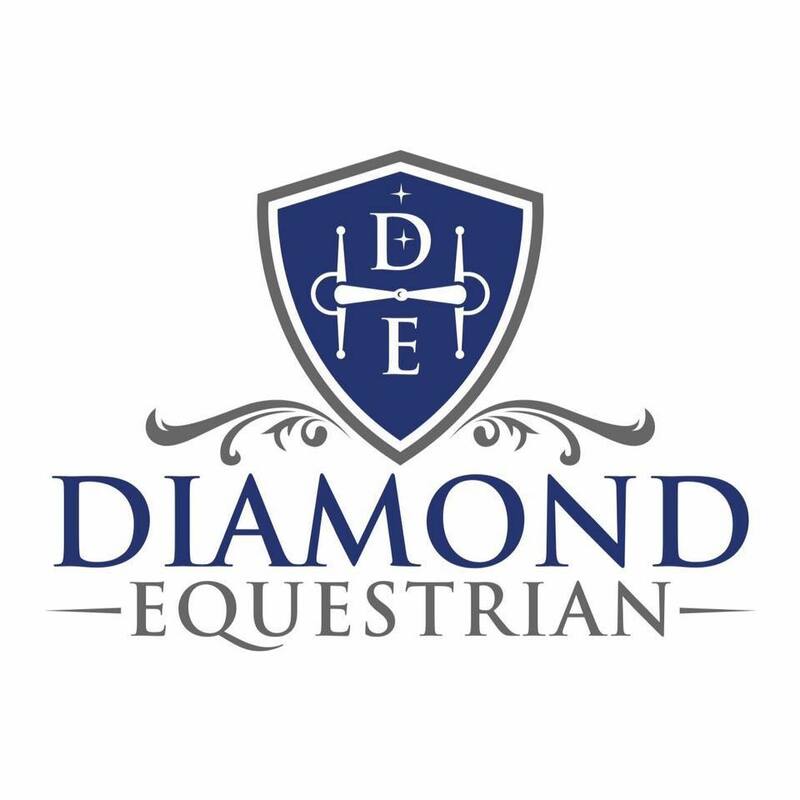 Oscar and I are incredibly proud to be Brand Ambassadors for Diamond Equestrian, an online shop specialising in beautiful matchy and sparkly browbands. The owner Evie generously gave Oscar and I a £20 voucher to spend with the company and because Evie is passionate about the highest quality for the best price, this went a long way! It took me some time to decide whether to go with the dreamy deep purple saddle pad at £30 or to bling up my everyday brown bridle with some sparkle for £20? As my saddle pad addiction, sorry...collection doesn't need any encouragement I opted for the browband. The delivery was fast and my browband arrived as described and packaged beautifully complete with mini diamonds in the bubble wrap, it was very special to unwrap and I thought what a fabulous present idea this is for any equestrian, safe in the knowledge it would arrive perfectly packaged by Evie herself with serious attention to detail. The pure silver three row browband couldn't suit our needs more, I wanted something simple and elegant that wouldn't look out of place when hacking out or going showjumping, this fits the brief perfectly! 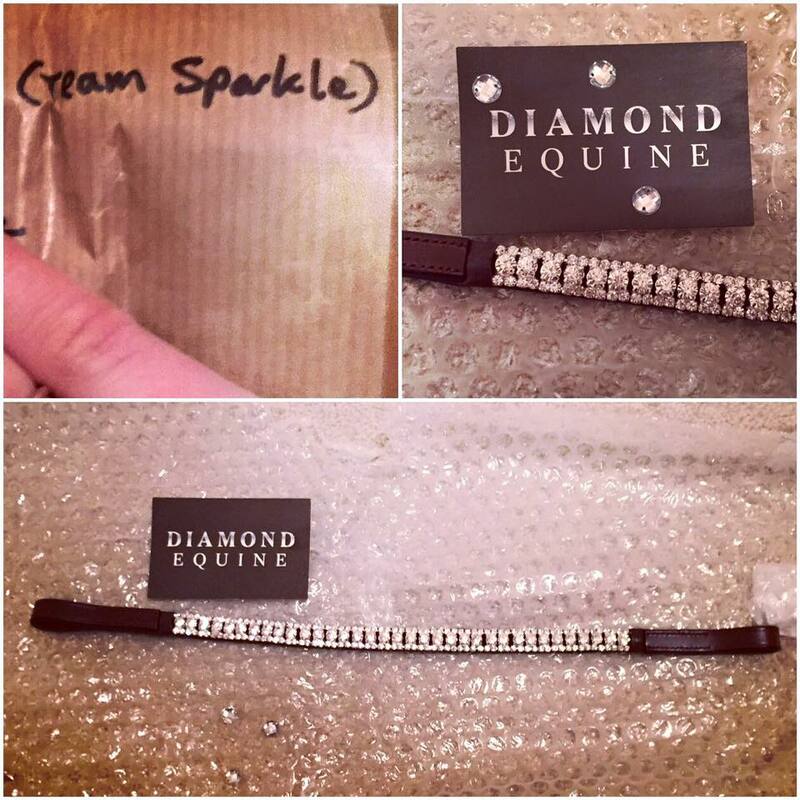 The browband has a slight curve and made from buttery soft leather - the website makes a point that the brown leather is a deep red and my photo shows the slight difference between my havana bridle leather and that of the browband, I can easily soak the loops to make them match so this doesn't concern me - and the diamanté crystals shine clear and bright in the light, the quality is outstanding for the price of £20. 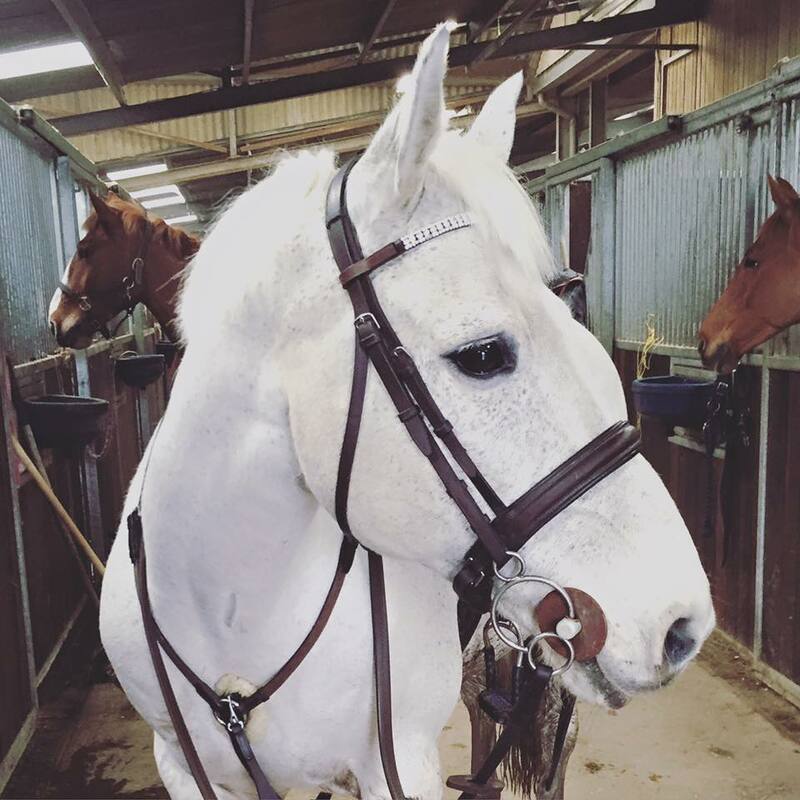 Oscar is extremely comfortable in it and wears size cob, Diamond Equestrian include sizes and measurements on the website to ensure you ordered the perfect size. 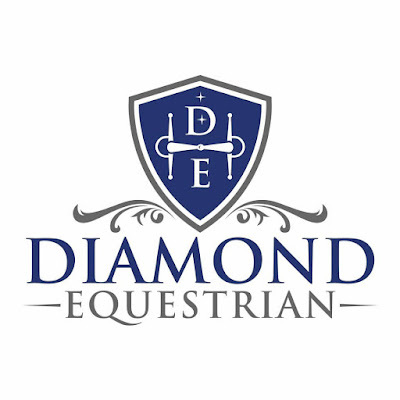 Please visit Diamond Equestrian on Facebook and Like the page. Oscar needed a flatwork bridle...I jump and hack out in a different bit to the one we wear for our flatwork and for years I've duly changed it dependant on the days exercise routine, whipping off the martingale to practice our dressage moves! Some evenings I huffed and puffed at the effort and it was forever on my list of things to do to search for a smart black bridle, so when I discovered the beautiful brand PS of Sweden, I knew it was time to invest and separate my two disciplines. I choose not to use a flash, I believe less is more until proven otherwise and this dictated my choice of bridle as PS of Sweden only offered one - or possibly two, my memory fails me - with detachable flash strap, I chose the Elegance Revolution Bridle. PS of Sweden bridles are instantly recognisable, they're patented design is like no other, they're not afraid to be different. The crown piece of every bridle is shaped to reduce pressure behind the sensitive ears and extra padding offers more space for the ears to move naturally, at first I was taken aback by the size of the head/crown piece, Oscar only has a little head and I didn't want it to overcrowd him but it doesn't look over big when worn and he continues to be soft and flexible at the poll when wearing it - his bridle path however has trebled in size. "We believe in innovation - and we want to be in the forefront"
The cheek pieces are rolled leather with hidden french hooks and elastic inserts that PS of Sweden call 'cradles' these allow the bit to be suspended in the horses mouth. 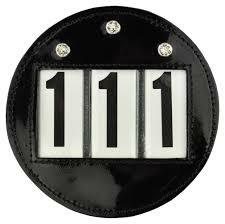 PS of Sweden say this can relieve poll pressure however aren't British Dressage legal in the UK. Out of curiosity I rode with the cradles for the first few wears of the bridle, Oscar being the clever pony he is learnt he had extra give, and once the elastic was at full capacity threw in a head toss. I think the cradles gave Oscar an inconsistent contact, one that he then tried to take control of, with a young horse these may be beneficial in building confidence when first introducing a contact. Thankfully they're easily snipped and as I said above, not dressage legal therefore wouldn't have been something I'd have kept. The noseband is gorgeous, shiny and padded and shiny and black and soft and....shiny! You get the idea, it has rolled edges with a detachable rolled flash that is easily removed, and a padded chin plate with a crank buckle. Everything is a little bit special about the PS of Sweden brand and the browbands are no exception. Using a design called 'Click-It', these do exactly what they say and 'click' into place with the blue PS logo on the side. This means you can change the look of your bridle without taking it to pieces and putting it together again, the Elegance Revolution came with a rolled black leather browband and I couldn't resist changing it for their Rainbow Dream design, a row of sparkly beads that shimmer all the colours of the rainbow in the sunshine, it's dreamy. You might notice one thing missing...throat lash anyone? PS of Sweden' range of bridles do not have throat lashes, for dressage Oscar and I don't need one, if you felt you did though you can order one online with your purchase to attach to the bridle. PS of Sweden finish their bridles with gun metal buckles and English vegetable tanned leather, I found to be very soft and easy to care for, it didn't take any "wearing-in" I immediately found it soft and supple. So far my review has been full of superlatives, but there is one negative I have to honestly discuss...the sizing?! I ordered cob size, Oscar wears a cob size in his headcollars and other bridle. I found the cheek pieces to be too long and the noseband too small (I like a crank to be worn loosely), thankfully there was enough leather to punch in more holes which has allowed it to fit beautifully but it has left me curious about how Swedish cobs differ to ours here in the UK? Maybe I could offer Oscar as a model? My PS of Sweden parcel was courier by UPS, I received my bridle, beautifully wrapped and packaged the same week I placed my order.